The biggest drawback of riding a chain-driven motorcycle is chain maintenance. My friends with their big 1200GS bikes love to gloat about their maintenance free driveshafts. With full disclosure, I admit I am terrible at chain maintenance. I don’t clean nor lubricate the chain on my BMW F650GS Dakar (aka “Doc”) motorcycle enough. As a result, over the years too many of my chains have seen premature deaths due to my negligence. 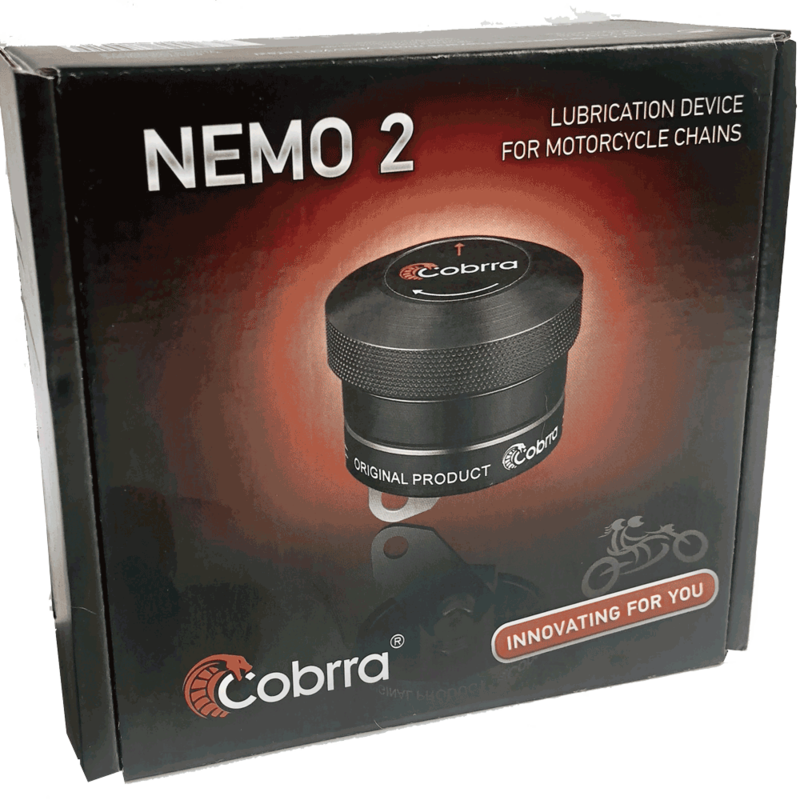 Thanks to the Nemo 2 automatic chain lubrication system by Cobrra, I can rest easy and truly ride free. With just a simple quarter twist of the dial on my Nemo 2, I send oil directly to my chain when it needs it. I do this every 100-200 miles depending on riding conditions. I twist more frequently in dirt or wet weather, and less frequently on well paved roads. Even more, the Nemo 2 is clean and convenient. Unlike most chain oilers that are either gravity or electronically fed, Nemo 2 uses a pressurized system. The twist of the reservoir dial puts pressure in the line which forces the oil to the chain for several minutes. Then it stops. No greasy oily mess and a perfectly happy and lubricated chain. The Nemo 2 is designed by the braniacs (and riders) at Cobrra in Slovakia—a small company dedicated to designing and manufacturing quality products. To be sure, Cobrra sent me the Nemo 2 to evaluate, but I would have bought one anyway. Anyone who isn’t consistent with their chain lubrication (and that’s most everybody) should get their hands on a Cobrra Nemo 2. In the United States, you can order a Cobrra Nemo 2 from Epic Trekker, who call it the best damn chain oiler. Also available at Best Products. Here are a few photos of the Nemo 2 by Cobrra installed on my GS650 Dakar.